On Sunday, after a twenty year absence since its last incarnation in 1991, Dexter Ricketts' One Love Peace Festival made its return to London at Wembley Arena. A boisterous lively crowd was treated to the kind of large scale community reggae event for which the capital has been crying out. The festival's red, green and gold spray painted logo was a good indication that while the UK and JA's rich reggae history should be celebrated, all ages were to be catered for. Thus roots music dominated in the afternoon before giving way to hip hop, dancehall and grime. The ever dependable Horace Andy - a veteran of the festival - sang classic sides like Skylarking and Cuss Cuss. Then the place went wild for Gyptian as he closed his set with smash Hold Yuh. 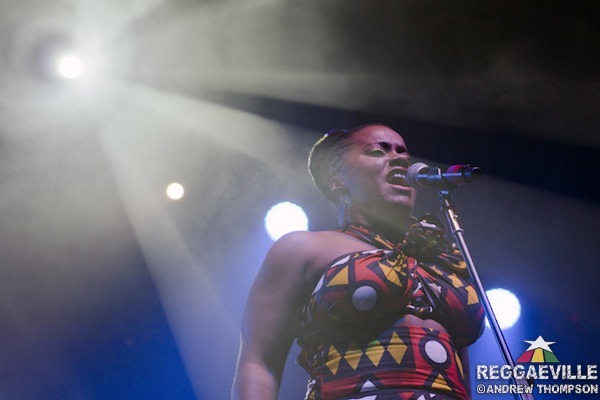 But the most surprising early performance came from Etana and France's Dub Akom band. She started slow with August Town, got everyone onside with a Jimmy Cliff medley, and bigged up deceased singer Amy Winehouse - ensuring that by People Talk the venue was in the palm of her hand. Next it was the turn of homegrown veterans Aswad. The Ladbroke Grove group showcased dubby vintage endeavours like Love Fire, African Children and Warrior Charge with pop reggae hits Shine and Don't Turn Around. Minus original frontman Brinsley Forde (who would appear up-schedule for a Bob Marley tribute with ex-Cimaron Winston Reedy and the feisty Sylvia Tella) they still made the cavernous shoe box that is the Arena rattle with their drum and bass. John Holt (backed by Tottenham's Mafia & Fluxy) played one of the longest sets of the fest - which would come back to haunt some of the later artists as the 11 o' clock curfew became reality. Practically an honorary Brit, having performed here so many times - he shared standards like Sweetie Come Brush Me, Help Me Make It Through The Night and Police In Helicopter in those unmistakably musty, lived-in yet compelling tones. Like most festivals the frequent mention of sponsors Lyca Mobile, Choice FM and the Voice newspaper gave proceedings a communal if corporate feel. But when Mayoral adviser Ray Lewis mentioned his paymaster Boris Johnson the chorus of boos suggested the anti-establishment element to reggae remains intact. Mr Lewis then got a big cheer for his message of unity to combat gang crime - one that was rightly repeated during music breaks. Another of the sponsors, artist-turned-chef and entrepreneur Levi Roots then reminded us there was more to him than his Reggae Reggae Sauce with an appropriately cultural set. Even the jaunty theme tune to his condiment got a welcome remix over the Taxi rhythm. One of the performances of the festival followed with original roots harmony trio the Abyssinians, powered by Harlesden's Ruff Cutt band. Their ghostly harmonies are always wondrous to behold but this was the first time in a while they'd played London with a horn section. It featured the hardworking Henry Tenyue on trombone - a man who seemed to be on stage almost constantly through the day. 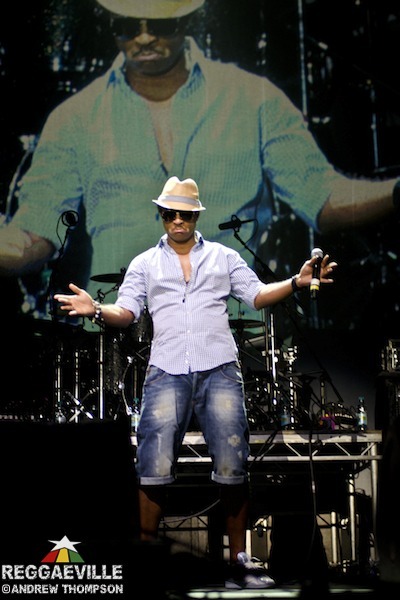 At t his point the hip hop and dancehall second phase of the event began. Busta Rhymes, along with hype merchant Spliff Star and DJ Scratchatator whipped everyone into a frenzy, cracking open the champagne to celebrate being back in the UK after three years. They only cranked a few bars of early work like Woo Ha but no one was complaining as they cupped their hands to their ears and drew the biggest screams heard so far. Sadly, theirs was the last set to be untouched by impending time constraints. Where Roots fans may have been happy, grime followers were disappointed when Skepta - announced as "the UK's Busta Rhymes" had to depart after just three tunes. Even more affected was Princess Nya who nearly got dropped altogether but stole two songs grace. Sean Paul, sporting a bizarre Travis Bickle haircut, still got a sizeable run, starting with dancehall material like She Want Me and moving to one drop fare such as his cover of Alton Ellis' I'm Still In Love. Finally at five to eleven - seeming to court disaster with his lengthy video montage - master entertainer and philanthropist Shaggy arrived. Fortunately another twenty minutes of stage time had been secured for a short performance - containing hits Mr Boombastic and It Wasn't Me. Online reaction to the festival has been mixed – with criticisms on the official Facebook page of the time keeping, the sound quality and absence of Ky-Mani Marley and Third World (which was announced on the website but not on stage). Despite these letdowns, it was good to see an event of this size take place in London again.